A silent piano is a type of acoustic piano that prevents the hammers from hitting the strings when a note is played. 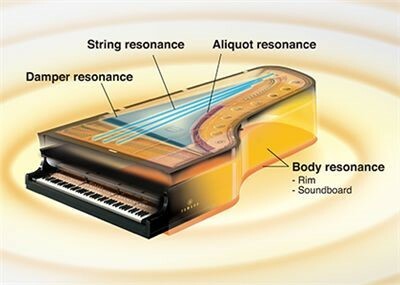 Instead, sensors pick up the movement of the piano keys, converting them to a MIDI signal that plays a digital recording of the sound through headphones. This sophisticated sensor-technology enables the pianist to play a real acoustic piano at any time of the day or night without disturbing anyone. The Yamaha Silencing Systems are some of the most technologically advanced on the market, featuring a broad range of pre-recorded sounds, the ability to record and listen back to your performances and connect mobile devices with a selection of the latest apps. Both the Yamaha SILENT Piano SH2 and SC2 feature the individually sampled sounds from some of the world’s most legendary grand pianos – from Yamaha's beautiful concert grand to the legendary Bösendorfer Imperial. 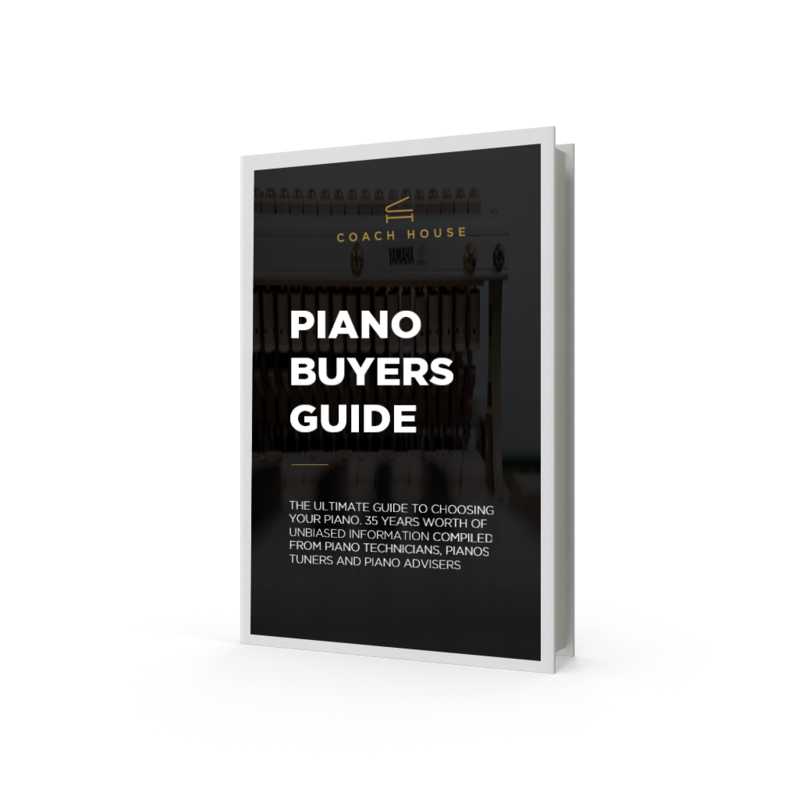 This gives you the ability to play the concert piano of your dreams, immersed in the atmosphere of the music hall, but from the comfort of your own home. Yamaha’s flagship CFX grand piano boasts a wide variety of tones, from effervescent high notes to booming bass tones, while the Bösendorfer is known for its full-bodied, rich Viennese sound. The SILENT Piano offers a range of pre-installed sounds from electric pianos, harpsichord, and organs, which allows you to select the voice to suit your musical preferences. Yamaha’s sophisticated binaural sampling technology takes samples from Yamaha’s CFX concert grand piano using highly-tuned microphones that capture the location and the nuance of individual sounds. The result is so smooth and so natural that you’ll forget that you’re even wearing headphones at all. 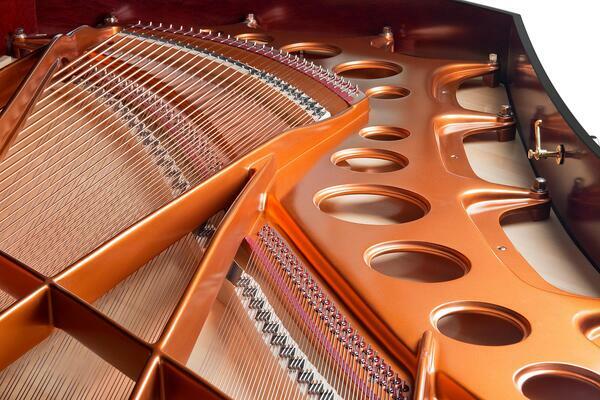 This is the natural vibration caused by the body of the concert grand piano. In a grand piano, sound echoes through the body of the instrument, which results in a rich reverberation that produces a wall of sound. This process is reproduced using highly-advanced Virtual Resonance Modeling (VRM). The original VRM calculates the condition of the strings for each of the eighty-eight keys on a piano, from one moment to the next. It also takes into account the timing and depth when the damper pedals are pressed. The enhanced VRM will also calculate aliquot vibration within the upper octaves, and the full resonance of the rim, frame and soundboard. This kind of technology offers a realistic, vivid and varied form of expression that showcases the limitless number of factors which make playing the piano such a joyous pastime. The SILENT Piano's SH2 and SC2 feature the very latest iteration of the Yamaha Smooth Release technology, offering the crisp staccato inflexion and the continual tone as the keys are released. This provides an incredibly nuanced response to how the pianist is playing. The very moment a pianist’s fingers lift from the keys of a grand piano, minute changes in tone occur as the tampers lower onto the strings to restrict its sound. The key-off samples are actual recordings of these changes, offering a faithful reproduction of even the most subtle of changes. Key Sensors – Under every one of the eighty-eight keys is a unique continuous-detection grey-scale shutter key sensor, pioneered by Yamaha. These sensors can detect the continuous movement of the keys, which means the player can play with complete freedom and flair even when the SILENT Piano function is active. These sensors never come into contact with the keys, which keeps the tactile feel of the keys the same, whether in silent mode or not. Quick Escape System – A grand piano fitted with the silent technology utilises a quick escape system which means that the muting mechanism can be fitted to the instrument without sacrificing any of the performance qualities. The system works by adjusting the distance between the hammers and the strings to ensure maximum playability whether playing acoustically or silently. The Yamaha SILENT Piano's SH2 and SC2 are designed with simplicity and sophistication in mind. A whole host of apps are available to enhance your piano playing, such as the “Smart Pianist” that enables you to select the pianos “voice”, control the metronome with a smart interface, or display the score on your smart device. The control unit is designed to ensure that it can blend seamlessly with the piano’s visual composition and is simple to operate. Yamaha is continuing to play a leading role in the industry and is consistently creating new and innovative solutions when it comes to piano playing. The SILENT piano system is no different. For more information about our range of Yamaha products or any other product we stock, why not give us a call or visit our Swansea showroom, where one of our expert staff can offer advice and support. For an overview of the differences in specification between the SH2 and SC2 systems, please click here.